This article describes the original floor shifters used on 1967 to 1969 Camaros with the 3-speed and 4-speed transmissions. The shifter will be covered along with the shifter rods and levers and shifter mounting. The 1967 through 1969 Camaro used several different configurations of shifters for the manual transmission. The base 3-speed Saginaw transmission (M15) was available with a column shifter or a floor shifter. 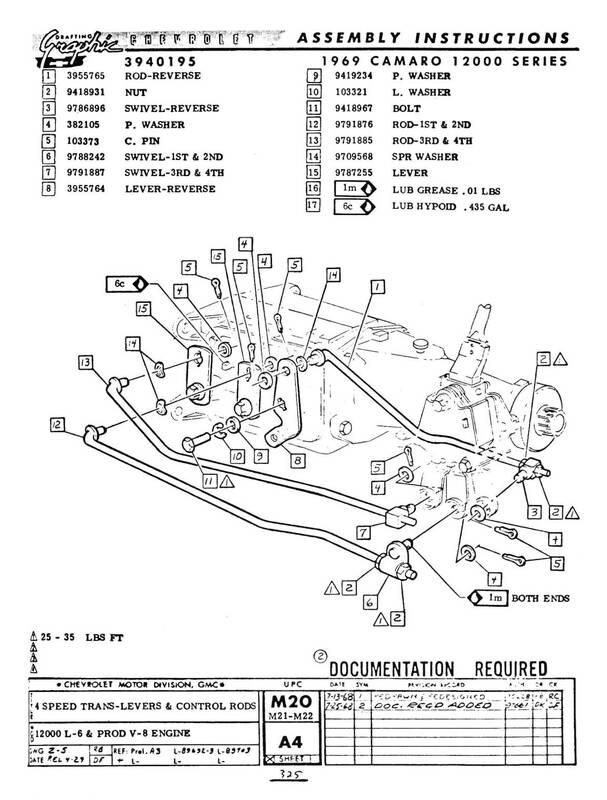 The column shifter was the default configuration; ordering RPO (Regular Production Option) M11, floor shift, or ordering a console resulted in the floor shifter. 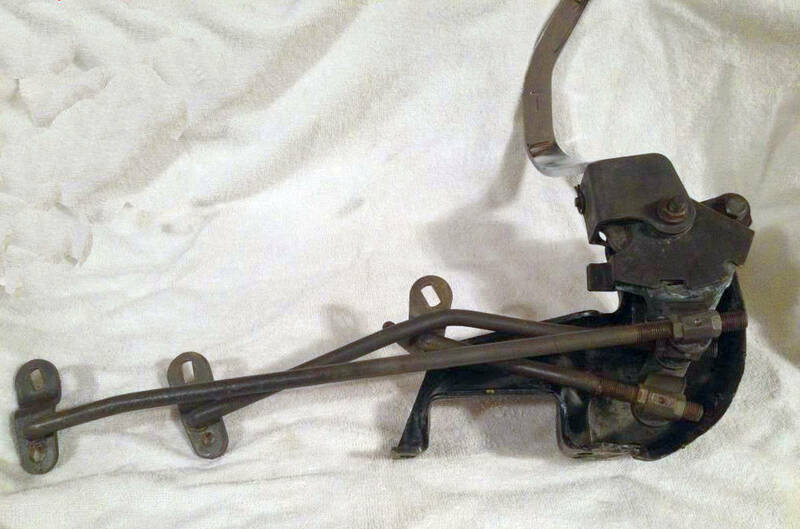 The heavy-duty 3-speed (RPO M13 in 67-68, or MC1 in 69) included a floor shifter. The 4-speed transmissions were available only with a floor shifter. 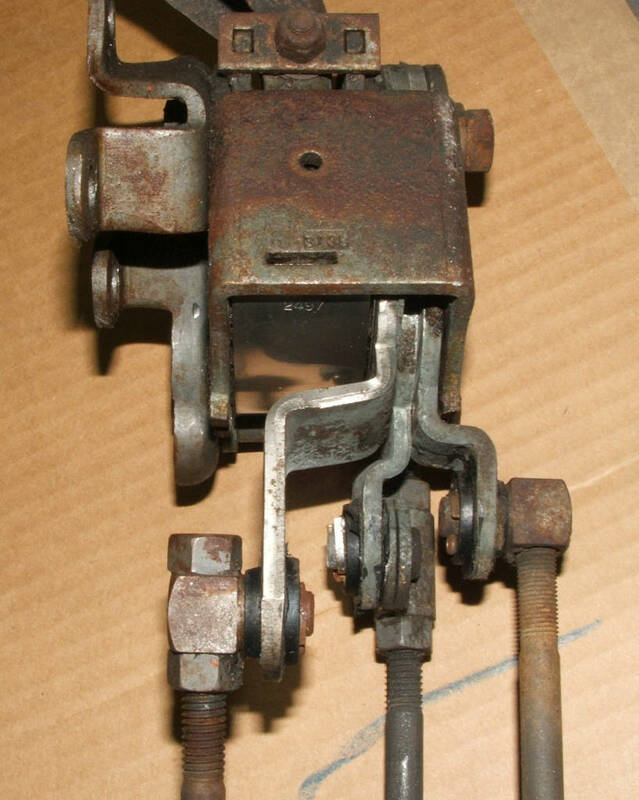 67-68 Saginaw and Muncie 4-speed shifters used a shifter that was mounted to the transmission crossmember. In 1969, the Camaro 4-speed floor shifters were changed to Hurst units. The Hurst shifter mounted to the transmission instead of the transmission crossmember. 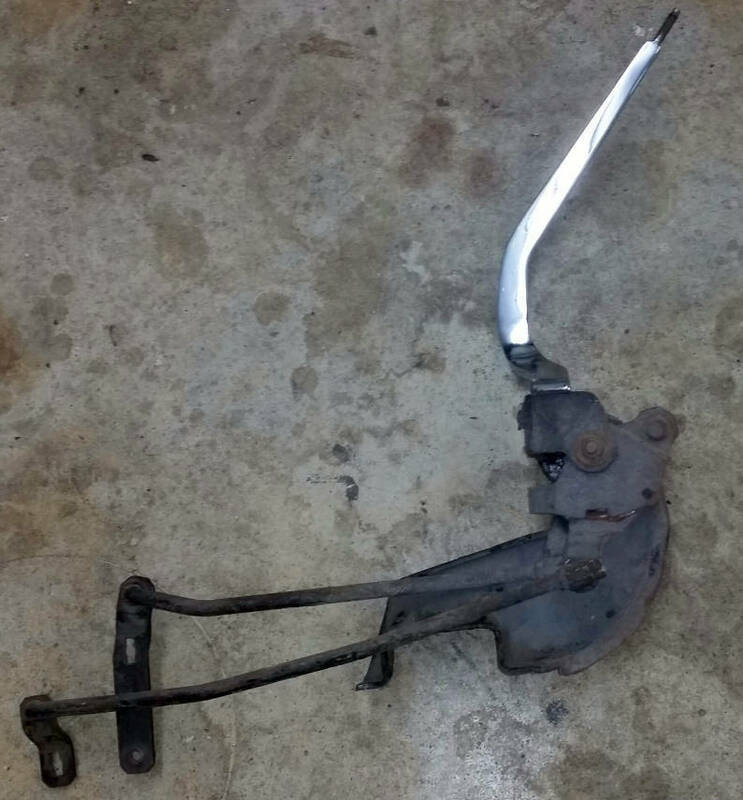 This eliminated the shifter binding while accelerating, which was a common reason that original shifters were swapped out for aftermarket shifters. 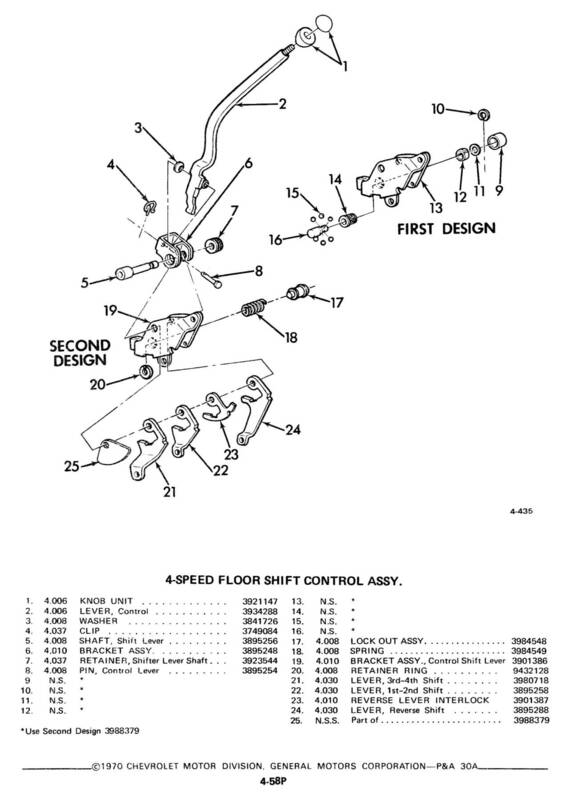 There is one basic shifter design used for the 1967-68 4-speed and 1967-69 3-speed shifters. The main difference between the 3-speed and the 4-speed shifters is that the 3-speed has only two internal levers for the shifter rods, while the 4-speed has three internal levers. The 3-speed shifter has a spacer that is replaced by the reverse lever in the 4-speed shifter. The 3-speed shifter design remained the same all three years, but in 69, the lever for 3rd gear and reverse was modified to accommodate the reverse lock-out rod. The shifter consists of two separate assemblies, the housing for the levers and the housing for the handle. The upper housing is attached to the lower housing by a large pin that uses a rubber grommet as a retainer. The reverse lockout assembly consists of the housing, piston, 6 bearings, a spring, washer, e-clip and protective cap. 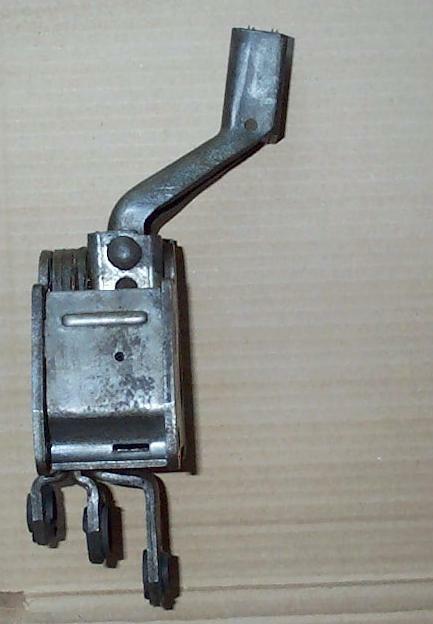 A second design of the reverse lockout simplified the assembly and was used for service. Both designs are shown in the attached exploded view. The same handle was used for both cars with bench seats and cars with bucket seats. While the handles themselves are physically the same, there were two different handle stampings. Some handles are plain and some are stamped “MUNCIE”. There are also versions of both with a “T” stamped lower on the handle. The meaning of this “T” is unknown at this time - possibly it is the supplier ID. 1967: The 3-speed floor shifter handle is typically plain. The 4-speed floor shifter handle is typically stamped with “MUNCIE” on the handle, though some shifters have unmarked handles. 1968: The 3-speed floor shifter handle is typically plain. 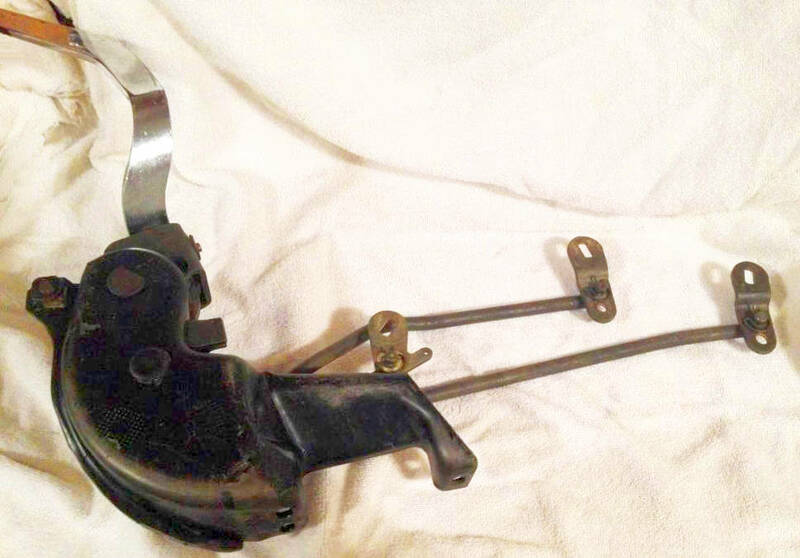 The 4-speed floor shifter handle for the Saginaw transmission is also typically plain. The 4-speed shifter handle for the Muncie transmission is typically stamped “MUNCIE”, though some shifters have unmarked handles. 1969: Data is limted, but what has been observed is the 3-speed floor shifter handle for the Saginaw 3-speed is plain and the handle for the MC1 HD Muncie 3-speed is stamped "MUNCIE". The shifter rod and shifter lever designs varied by transmission model. The Saginaw 3- and 4-speeds shared several parts. Both used the same two long rods. The 4-speed also used a third shorter rod for reverse. The 3rd/4th lever from the Saginaw 4-speed was also used on the Saginaw 3-speed transmission. The shifter rod diameter is 7/16”. The levers have 3/8” diameter holes for mounting the rods. Some rods have the last four digits of the part number stamped on them. The original 3rd/4th lever is stamped “C” and the 1st/2nd and Reverse levers are stamped “AAc”. The 3-speed 1st/Reverse lever design changed in 1969 due due to the reverse lockout mechanism. The Muncie 4-speed used one set of rods for the small block applications and one set for the big block applications. The shifter rod diameter is 7/16”. The 1st/2nd lever has “1-2” stamped between the two rod mounting holes. The mounting holes on the 1st/2nd lever are 5/16” in diameter. The 3rd/4th lever has “3-4” stamped between the rod mounting holes. The mounting holes on the 3rd/4th and Reverse lever are 3/8” in diameter. There are three distinct sets of stabilizer rods used: Saginaw, small block Muncie, and big block Muncie - all have a diameter of 3/8”. The overall length of the Saginaw rod is 10 9/16” and the small block Muncie rod length is 9 7/8”. The slot on the Saginaw rod is 1” long and on the SB Muncie rod it is 1 1/8” long. The big block stabilizer rod is 10 7/16" long and has an offset in the rod. It was used with both the heavy-duty 3-speed and Muncie 4-speed transmissions when optioned with a big block engine. 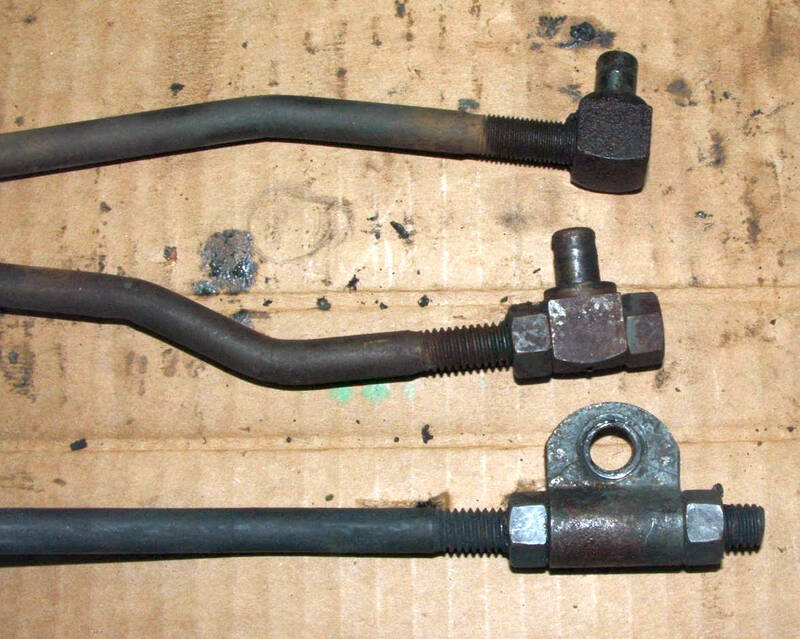 Stabilizer rods for big block (top), Muncie with small block (middle), and Saginaw 4-speed (bottom). Stabilizer rod for Muncie 4-speed and M13 3-speed with BBC engine. The stabilizer bracket is mounted on the transmission and the stabilizer rod attaches to it. The 67 and 68 brackets looks similar, but there are differences. The top lip on the Saginaw bracket bends forward and the bottom lip bends backwards. The Muncie bracket has both the top and bottom lips on the bracket bend backwards. The 1967 and 1968 Muncie brackets are slightly different in the length of the top lip. 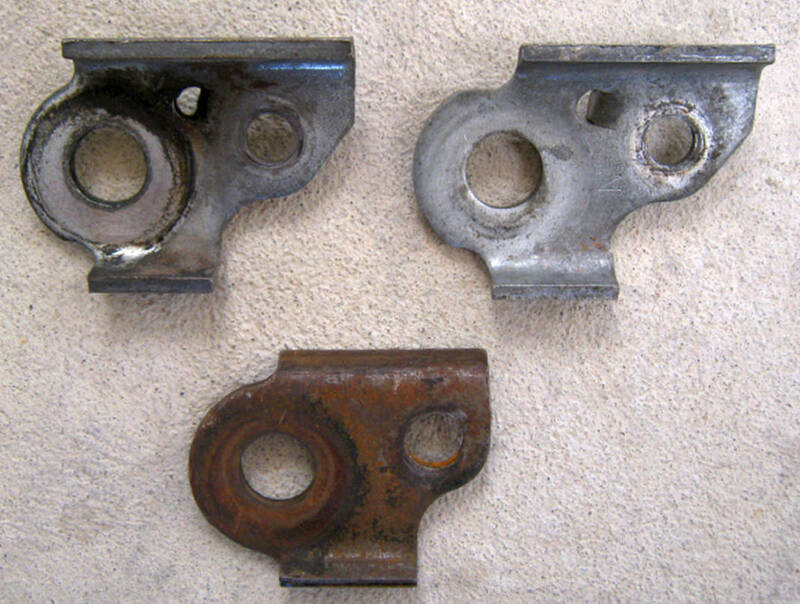 67 (left) and 68 (right) Muncie brackets, both “lips” curl backward. 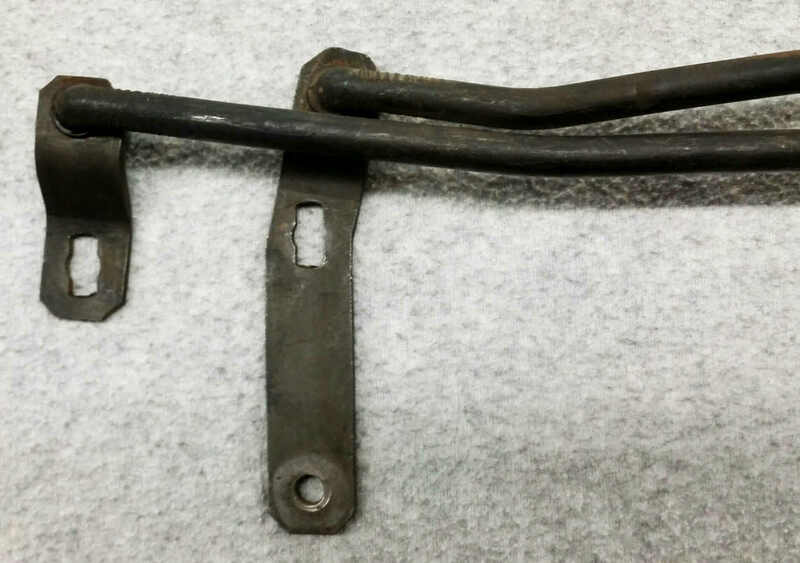 The bottom is a Saginaw bracket, the upper “lip” curls forward. In 1969, Chevrolet changed the 4-speed shifter to a Hurst unit. 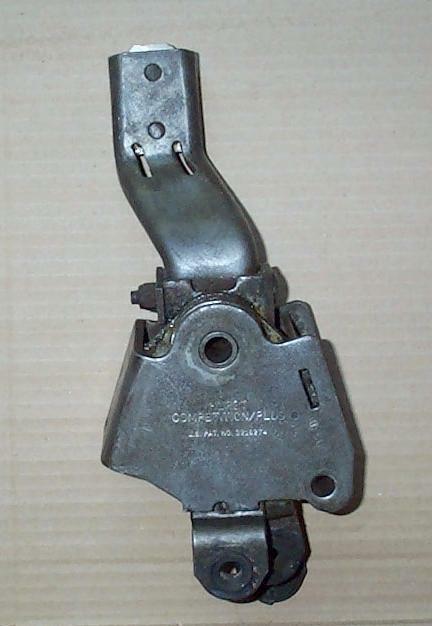 Other GM divisions had been using Hurst shifters for several years. Unlike the 67-68 shifter, the Hurst shifter is not mounted to the transmission crossmember. 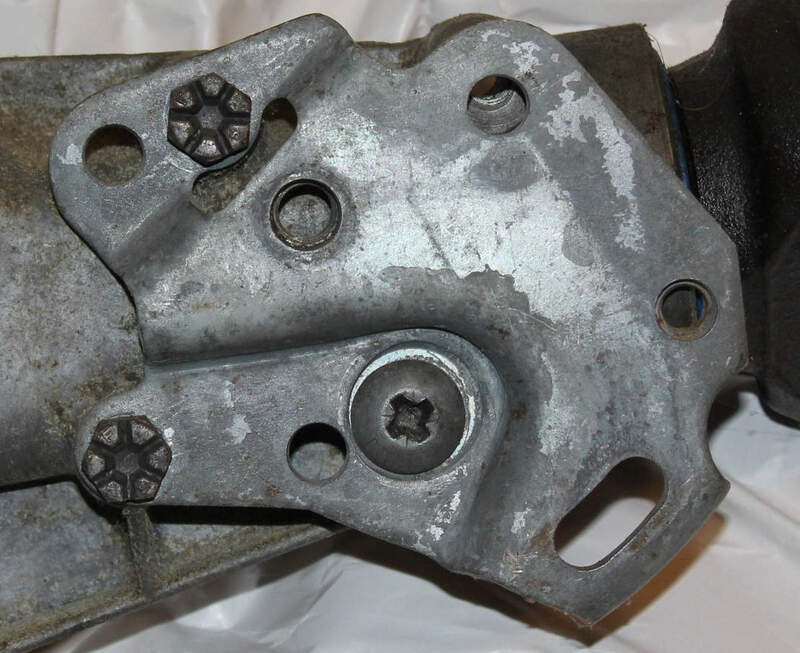 It is mounted directly to the transmission with a bracket that is bolted to the transmission tail housing. This eliminates the binding of the levers under hard acceleration. The shifter has an offset in the handle mount. 1968 and 1969 Pontiac Firebirds used the same shifter as 69 Camaros and Firebirds also used a 3-speed version of the Hurst shifter. The 1970+ Camaro shifter looks similar to the 69 shifter, but the offset is accomplished in the handle itself, not in the shifter body. The original shifters are different from the aftermarket shifters in several ways. There are no end stop adjustment bolts. 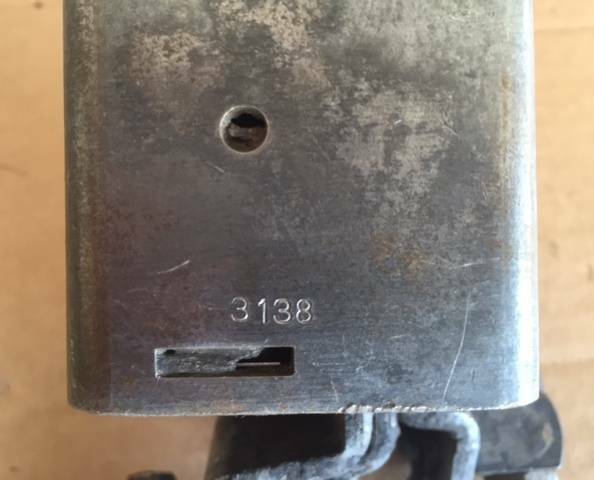 The main body of the shifter was stamped 3138 on the front (the 3138 shifter box was also used in many other OEM shifters). The handle is a "bayonette" mounting type with a round shaft and is held in place with two clips used in combination with two rubber isolators between the clips and the shifter yoke. The shifter handle is stamped 5325 on the part of the handle that slips into the yoke of the main shifter body so the number is not visible with the handle installed. The aftermarket handle is bolted to the shifter. The original shifter has molded-on rubber bushings where the 3 rods attach. 69 Camaro Hurst shifter side view. 69 Camaro Hurst shifter rear view. 69 Camaro Hurst shifter trans side view. The original shifters have a code number that include a date. The first digit is the month (two digits if October through December) and the next digit is the year. The rest of the numbers and letters are part of the batch number. 1968 and earlier shifters had 4 or 5 character codes, e.g. 48E3 for April of 68. 1969 shifters had 6 or 7 character codes, e.g. 128D11C for December of 68. 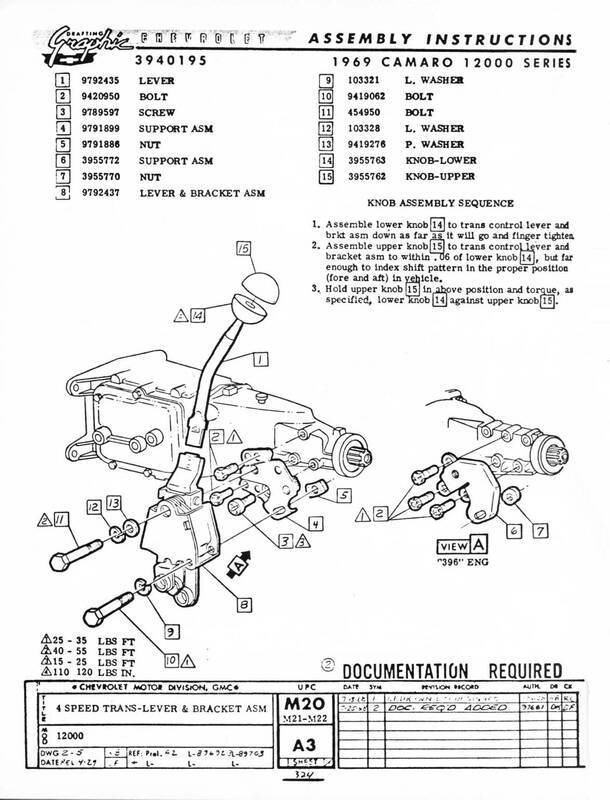 Most 69 Camaro shifters had the later code format, but some early build 69's have been observed with the earlier code format. The 3138 shifter body. Note there are no stop bolts on the body. Batch number stamped on main body of shifter. Date is April 1968. Clip (only one shown) and the two rubber isolators that hold the stick into the yoke. 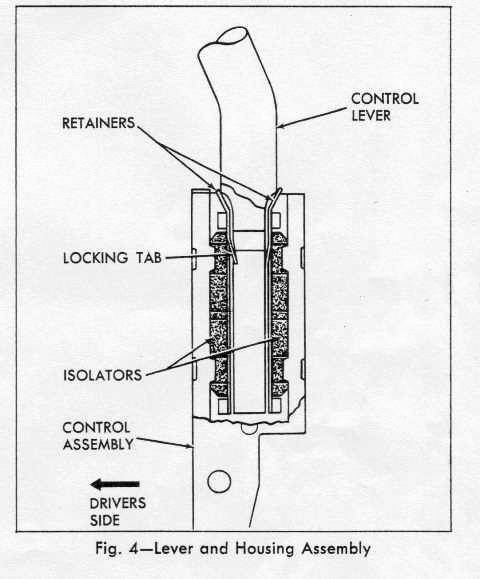 Diagram of shifter handle mounting. 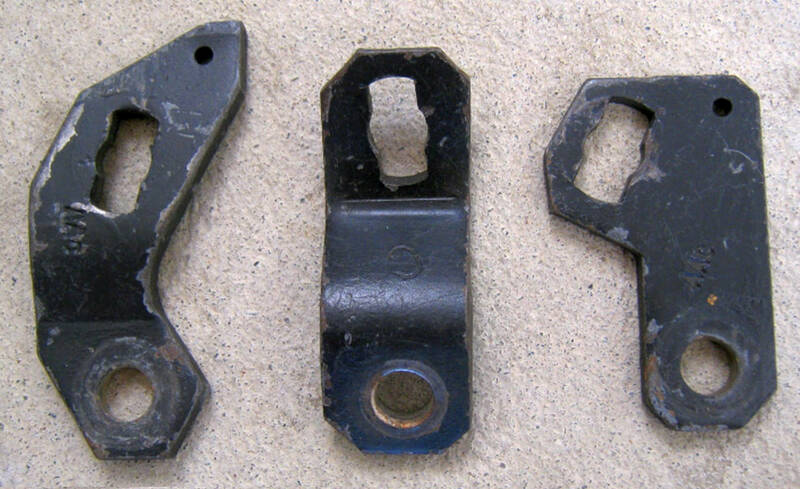 There were three different sets of 1969 Hurst shifter rods; Saginaw, small block Muncie, and big block Muncie. The 3-4 shift rod, the longer rod of the set, has fine threads. 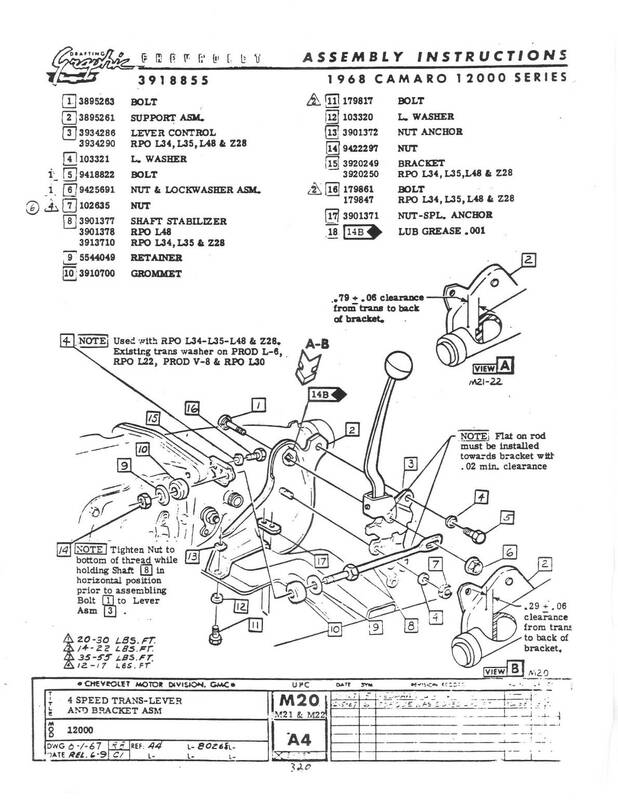 The other two rods have coarse threads and are adjustable with the locknuts, whereas the 3-4 rod is adjusted by rotating the rod in the threaded swivel on the shifter.The part numbers are shown on the table at the bottom of the page. 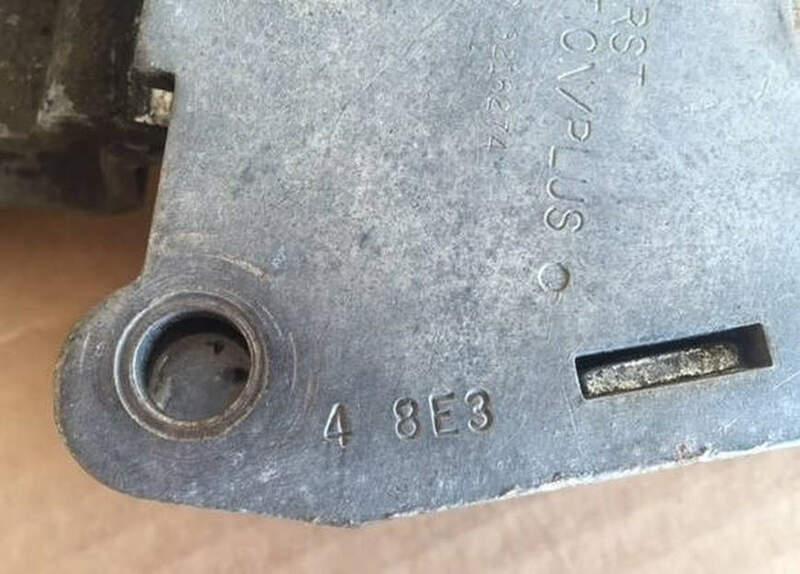 The last 4 digits of the part number are sometimes stamped in the rods, but not always. 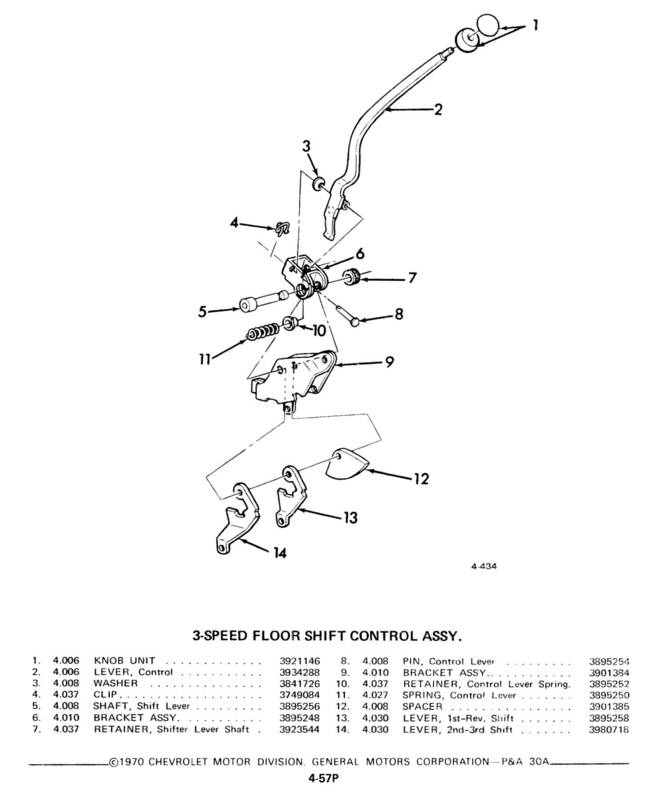 The shifter levers for 1-2 and 3-4 were the same for all three versions. Hurst rod mounting and threads. 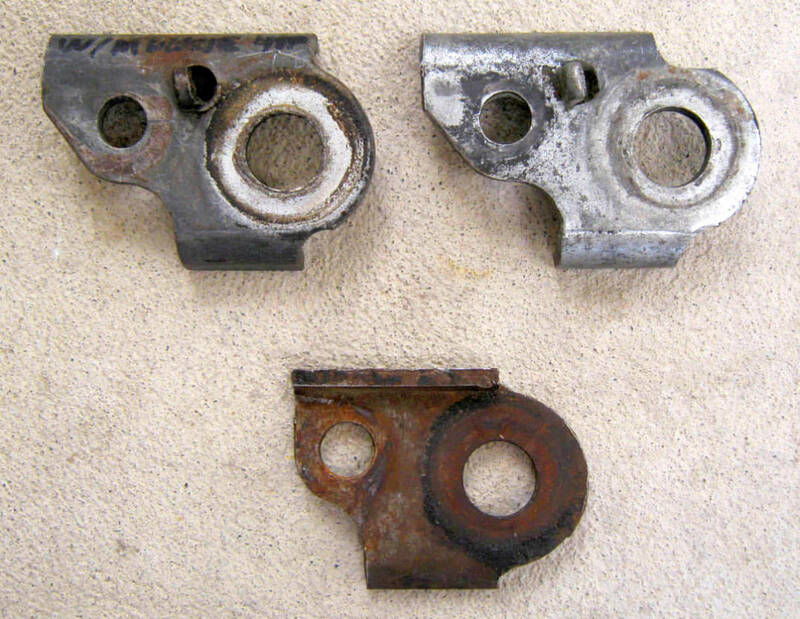 Two types of mounting brackets were used for 4-speeds in 69, one for small block and L6, and one for big block. The L6 / small block bracket was mounted with two hex head bolts and a Phillips pan head screw. The lower profile Phillips screw is required to allow the shifter to go into reverse. The big block bracket used three hex head bolts to mount the plate on the trans. The two different brackets also used different special nuts in the slotted hole for the shifter's lower bolt mount. The BB one was more oval-shaped to fit in the deeper pocket of the BB mount plate. 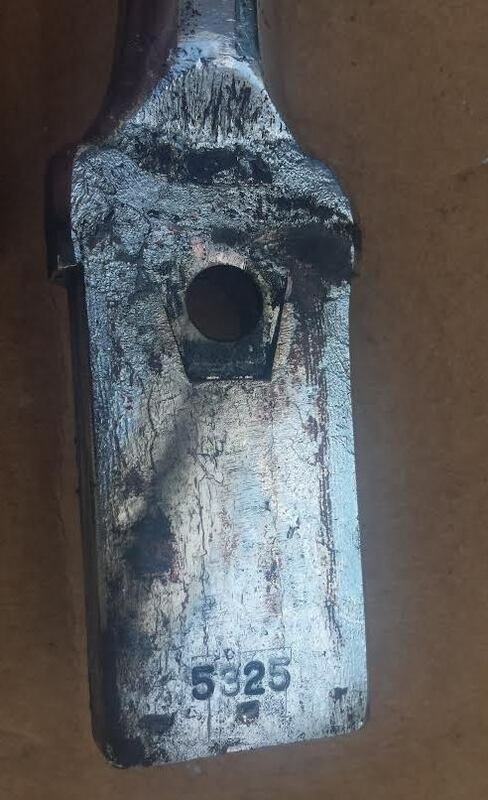 69 L6 & small block mounting bracket. 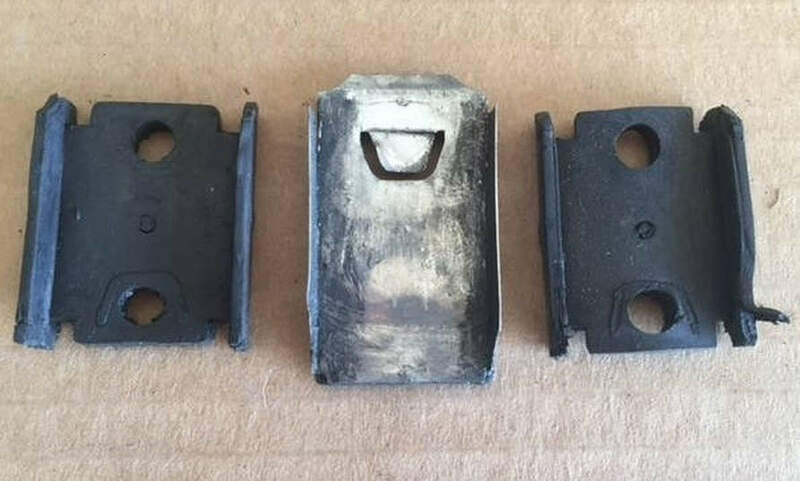 69 big block mounting bracket. Federal law required that the shift pattern be shown. In 1967, the pattern was always shown on the shifter knob. In 1968 and 1969, the pattern was shown on the knob for non-console cars. Console cars had the shift pattern shown on the console. 1967: All shifter knobs were two-piece and had 5/16"-18 threads. The upper knob piece is black and the lower knob piece is chrome steel. The shifter knob for the 3-speed and 4-speed had the respective shifter pattern on it. The lettering is white. 1968: The shifter knobs for the 3-speed without console and the 4-speed without console were the same as in 1967. 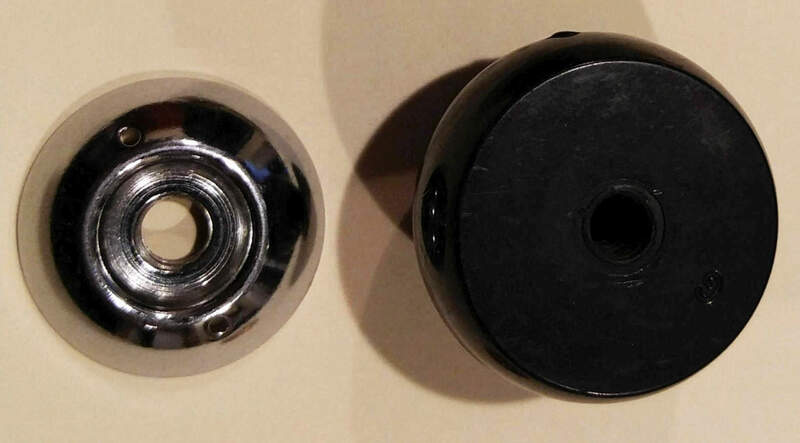 The shifter knob for cars with a console had a one-piece chrome knob with 5/16"-18 threads. The knob was a zinc die-casting and originals weigh about 4 ounces, whereas reproduction parts weight about 8 ounces or more. 1969: The shifter knob for the 3-speed was the same as 68. 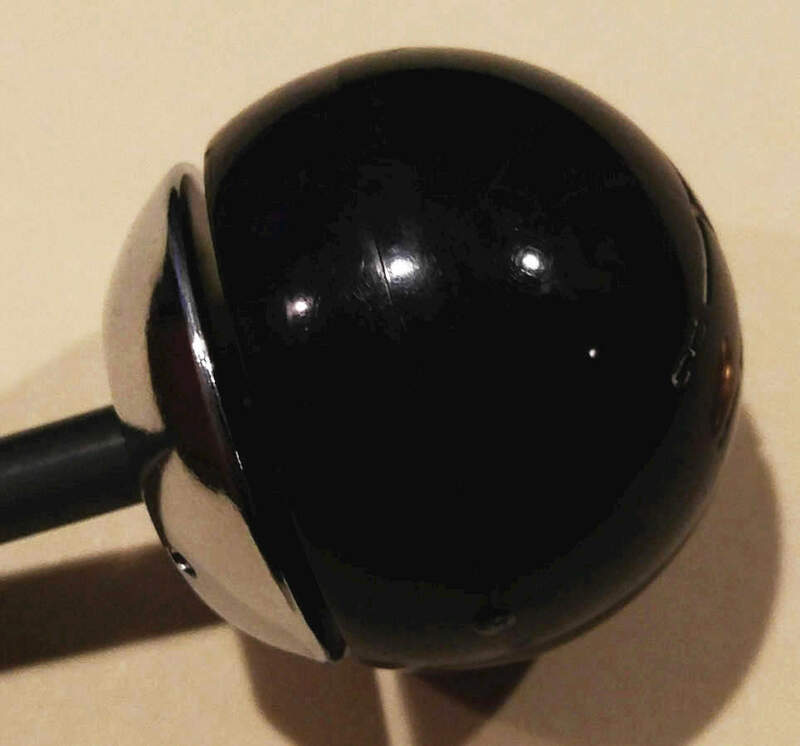 The shifter knob for the 4-speed Hurst shifters had 3/8"-16 threads. 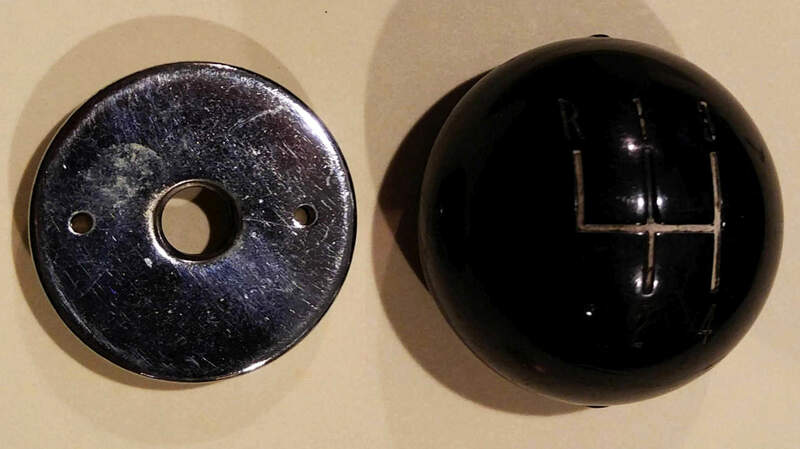 The shifter knob for the 4-speed without console was a 2-piece knob with the top part being black with the shifter pattern on it and bottom part being chromed metal. 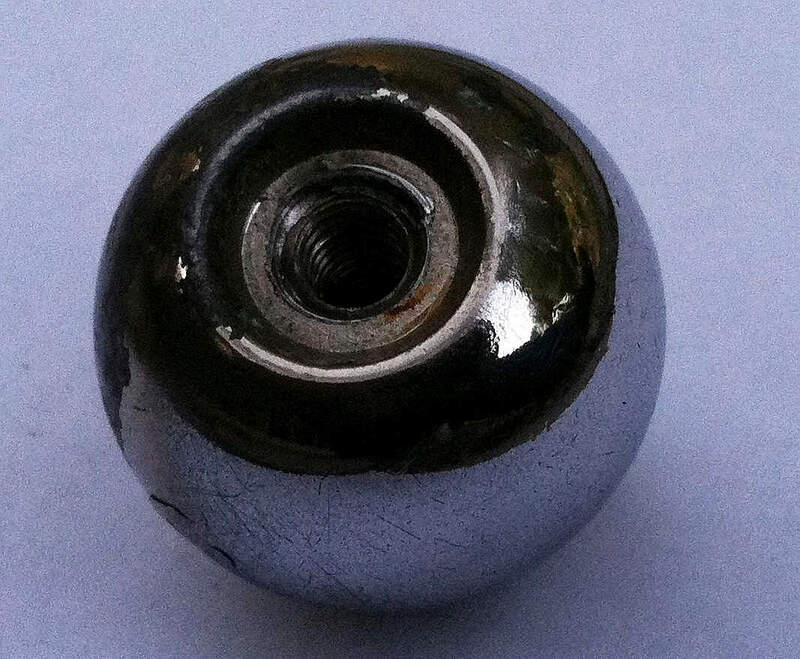 The shifter knob for cars with a console had a one-piece chrome knob. 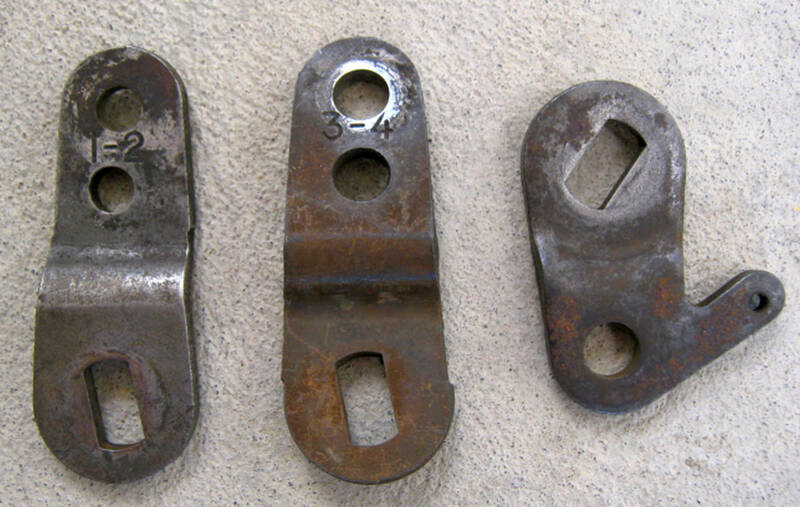 The knob was a zinc die-casting and 4-speed originals weigh about 4 ounces, whereas reproduction parts weight about 8 ounces or more. 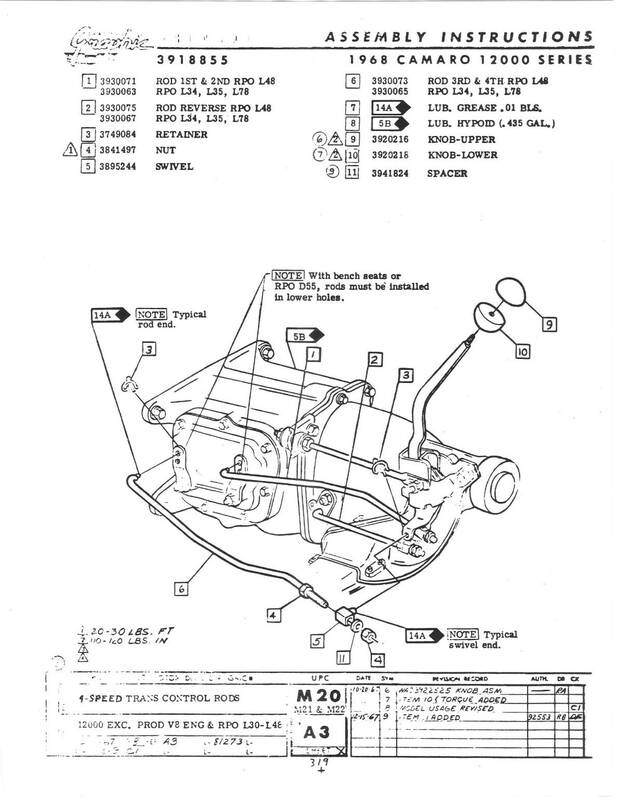 Note that the part numbers listed below are the original ones from the AIM. 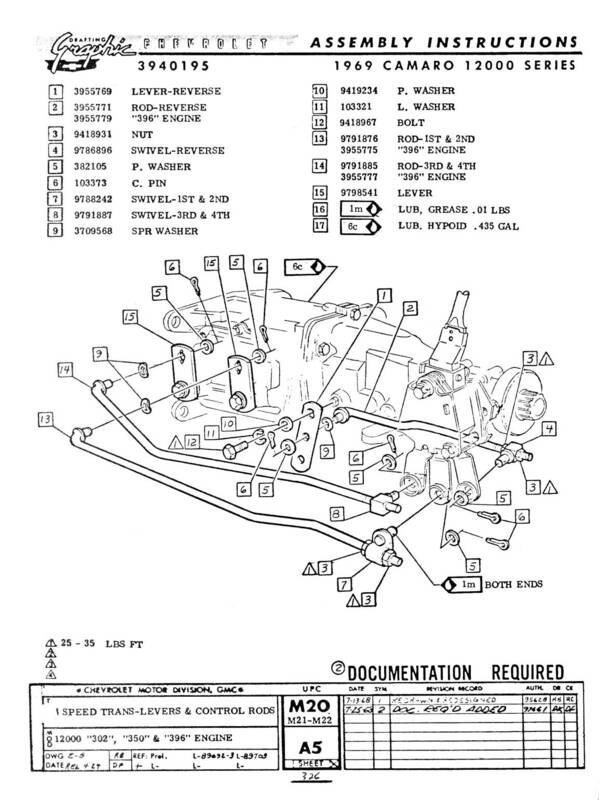 Many parts were serviced as a different part number. 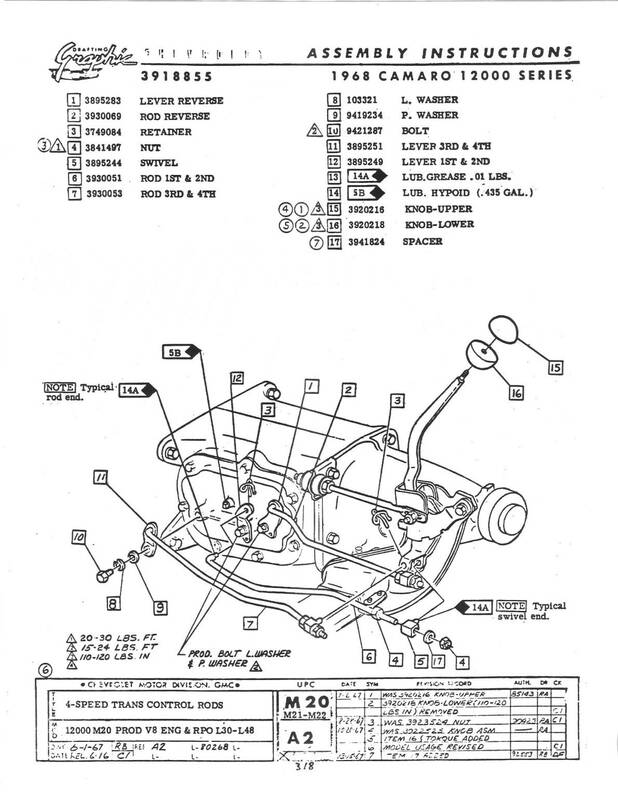 Descriptive information for some of the 67-68 shifter parts. 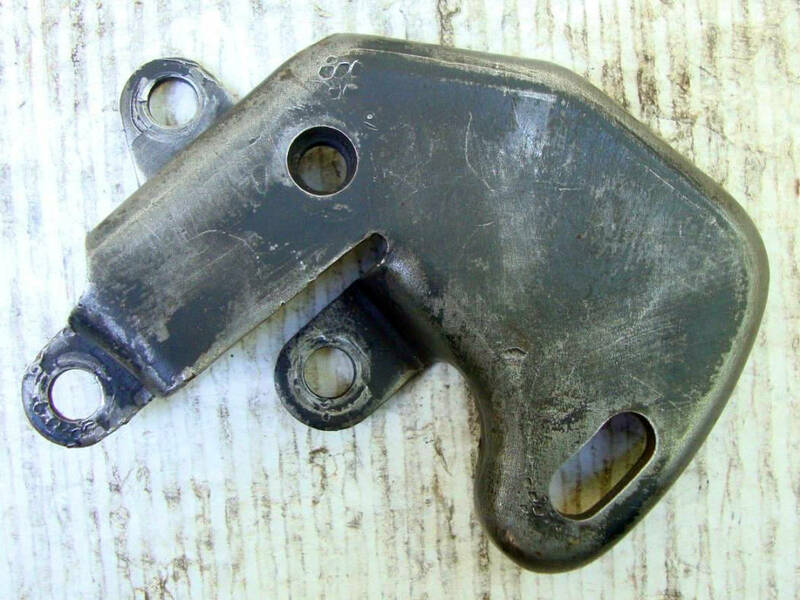 179817 - bolt (shifter bracket to cross-member) – this bolt is listed in 721A as 5/16” x 18 x 7/8”. 148145 - retainer, (reverse switch rod) – this is a standard hardware item. It is a pin or hairpin clip, the groove diameter is 1/8” and the length is 3/8”. 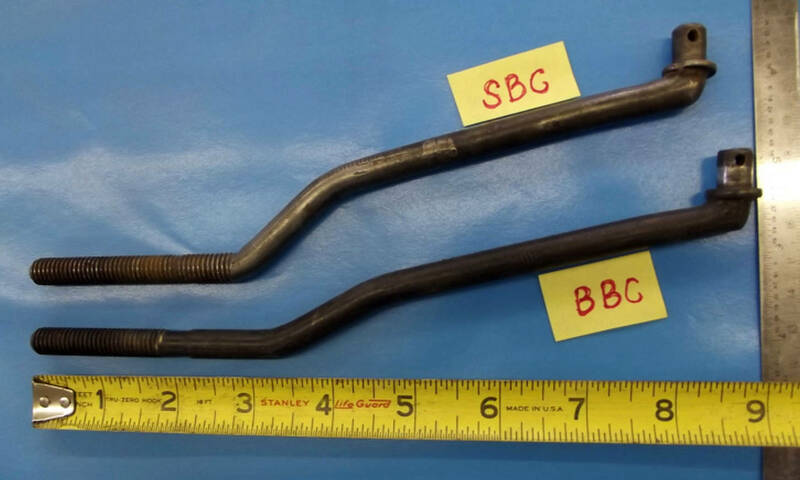 3895263 - bolt (stabilizer rod to shifter) – 3/8” x 16 x 3”, grade 5. The thread length is 1 ¼”. 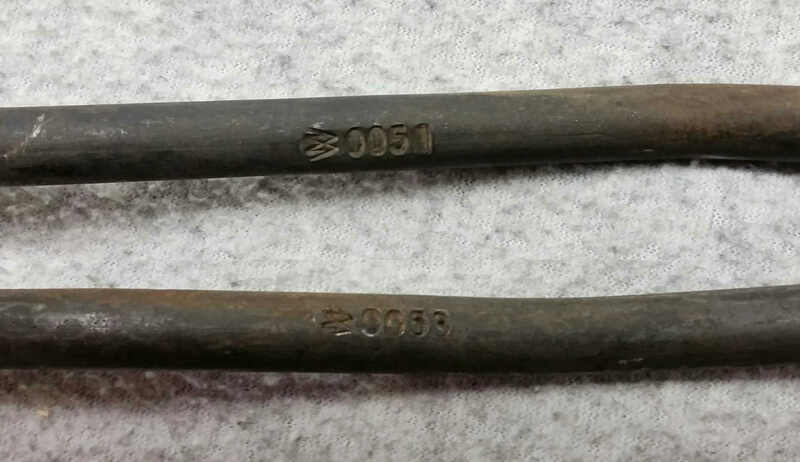 It is a flat-headed plow bolt. The head markings are “RBW” and one side of the head is cut flat. 3922533 - bolt (stabilizer rod to shifter) – this is a replacement for the 3895263 bolt. It is the same except the length is 3 5/16”. 3941824 - spacer (on the shifter rod) – an original 67 4-speed shifter and an original 68 3-speed shifter do not have these spacers. Some rods found at swap meets have these spacers and some don’t. 5544049 - retainer (stabilizer rod) – there are 2 of these retainers on the stabilizer rod. They are the same part number as the retainer on the front shocks and the front sway bar end link. 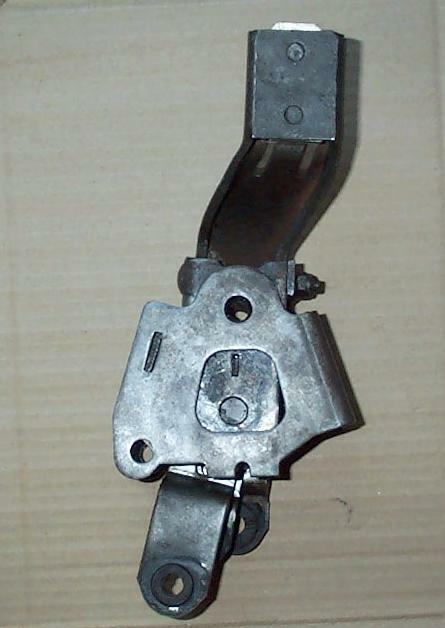 9418822 - bolt (shifter to mounting bracket) – this is 3/8” x 16 x 1”, grade 5. The head markings observed have been “RBW” and “C”. The “RBW” is possibly on 67 shifters and the “C” is on 68 shifters. 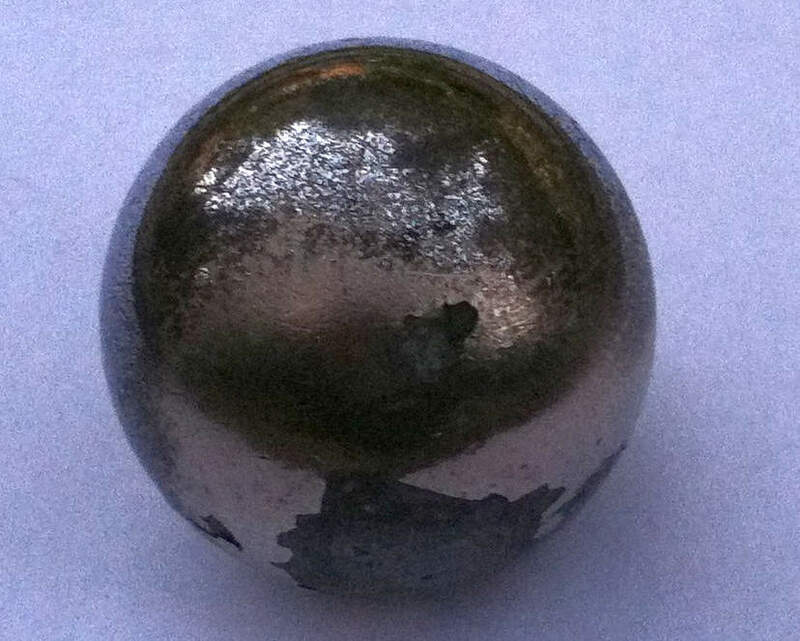 Reverse lockout ball bearings – The reverse lockout ball bearings are 0.1875” (3/16”) in diameter.